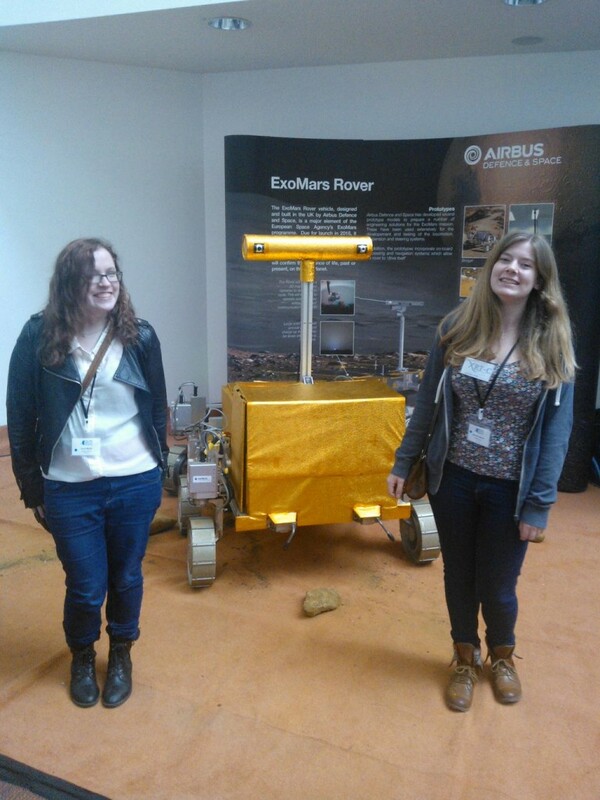 This weekend, delegates from the XRT-C team went to the UKSEDS National Student Space Conference. This is an annual meeting of students from astronomy and space societies across the country, featuring various astrophysics big names, and this year even an engineering model of the Mars Rover! The weekend started at 5:30am, with the seven sleepy XRT-C team members rolling out of bed ready to drive to Surrey. We arrived at half nine and, after taking the scenic route around the university campus in an attempt to park the cars, headed inside for the first talks. During the first day, we learned about career paths in Space Science, and about two different privately funded time capsule projects – one to the Moon and one to Mars. Both are really cool, check out http://www.timecapsuletomars.com and http://lunarmissionone.com if you’re interested. We also went to a talk about citizen science by Chris Lintott, presenter of the BBC’s sky at night. Citizen science refers to the growing trend of recruiting members of the public to help sort through the huge amounts of data modern tech produces – for example, you could look at pretty pictures of galaxies and categorise their shapes, or identify penguins in photos from the Antarctic. Head to http://zooniverse.org if you want to get involved! The highlight of the day had to be Dr. Matt Taylor talking about “The Rosetta Mission so far”. As well as talking about some of the science and engineering in the project, and what it’s like to run a mission with tech 20 years out of date (the mission left Earth 10 years ago) he also showed us some incredible pictures from the mission, and of course a “duck face selfie”: a selfie taken by the probe with the face of the duck-shaped 67P comet. After the talk we headed to the social, which featured rosetta-spacecraft-temporary-tattoos and an inebriated Matt Taylor, as well as a great chance to get to know students from across the country. Duckface selfie – space style! 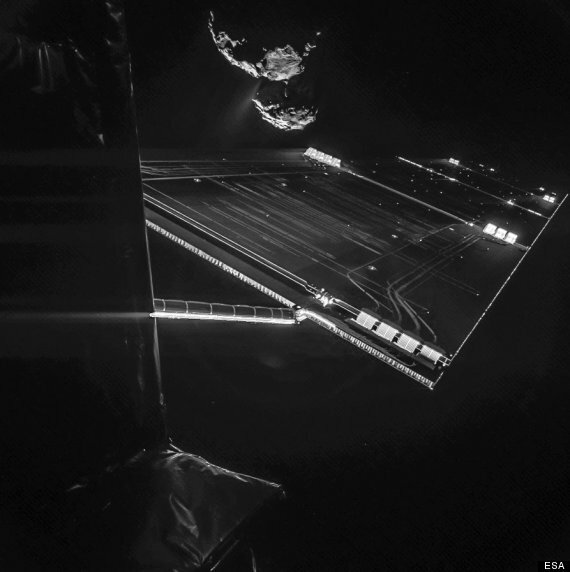 A Rosetta mission photo featuring the duck-shaped comet 67P. Image credit: ESA. Saturday also featured the inaugral NSSC awards ceremony, there’s a seperate post coming soon on the shiny shiny award we won. On Sunday Hannah Osborne gave a talk about our own project, which was really well received. We also got to hear a little about the work of Surrey “EARS”, the Electronics and Amateur Radio Society, which left us with loads of ideas for future projects for the Exeter team. The Surrey group sent a fluffy toy to space. It’s super cool. We’re really jealous. Future project anyone? They’re also planning to build a radio telescope of their own, so hopefully the two societies will stay in touch! 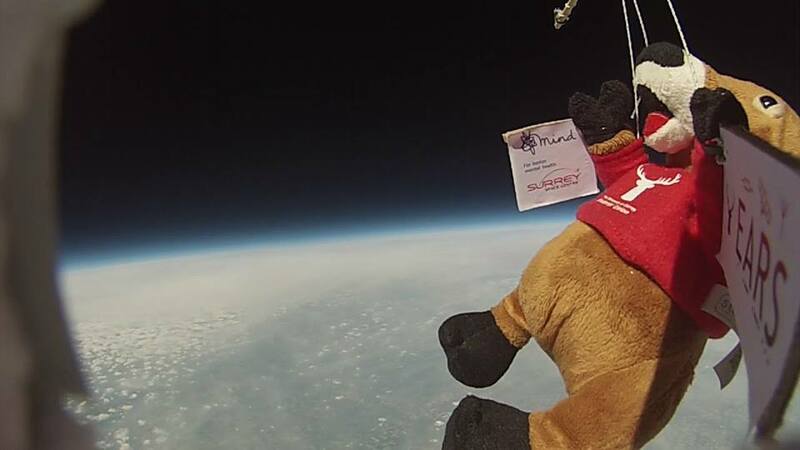 Surrey EARS sent this soft toy to space. The last two talks of the day were a fascinating (if terrifying) talk by Dr. Jen Gupta about all the ways the Universe is trying to kill us, and a discussion of Dark Matter by Dr. Anne Green. Exhausted but inspired, we headed to the AGM and finally back to Exeter. I have to say that I would urge anyone interesed in space to attend the conference next year. It’s been a brilliant weekend, and has left us all full of ideas and enthusiasm for space related projects.